To help you decide if decorative concrete is right for your home or office, here are a few frequently asked questions. Are decorative concrete surfaces slippery? While all types of hard flooring have a potential to become slippery when wet, we make your decorative concrete surface safe and slip resistant by adding a polymer grit to the concrete when mixing it. Adding the polymer will increase the amount of friction between you and the concrete and yet will not be visible. Is a concrete surface safe for my pets and other animals that live on or near my property? There are a few reasons that concrete floors are a good choice for homes with pets as well as other creatures who may drop by your patio or driveway. We finish our concrete with non-toxic materials. Using these safe products protects everyone who comes in contact with the surface. Once sealed, a concrete surface is nearly scratch proof. So, you do not need to worry about errant paws and claws. Concrete will not trap dander or other allergens; also, it will not offer a safe home to mites, fleas, and other pests. The surfaces are easy to clean and stain resistant. Are concrete surfaces hard and uncomfortable? 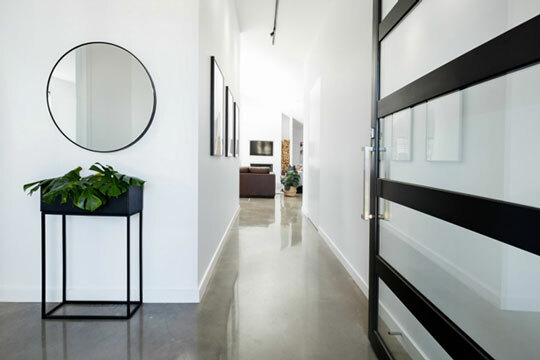 Traditionally, hardness and durability, make concrete a sought after flooring material. However, when used as a part of an indoor renovation, concerns are raised about detrimental effects of the hardness of concrete. In a home setting, using rugs or padded mats soften concrete considerably. Outdoors and in an industrial environment, a hard-concrete surface is preferable because of its durability. Does concrete look too industrial for my home? If concrete is poured and not enhanced, the flat gray surface does look dismal and industrial. We have a gallery brimming with examples of our decorative concrete works. We have so many methods and materials at our disposal that we virtually never make the same design twice. Can I be creative with decorative concrete? Yes, concrete is very well suited to be an artistic medium. We employ skilled designers who can assist you in creating a wondrous environment with concrete. Many choices of colors and blends of aggregates give you the ability to customize your concrete and enhance your home. The answer to this question depends on what other types of flooring you are considering. Most ceramic, stone and marble floors will cost a great deal more money than a concrete floor that is expertly enhanced. While carpets, laminates, and vinyl usually come with a lower price tag, they cannot match concrete in resilience or ease of maintenance. Contact us Today and experience the difference in working with true Decorative Concrete Experts.